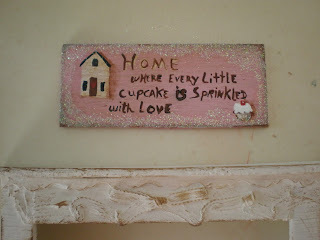 I worked on some details for "Sprinkled With Love Cottage." 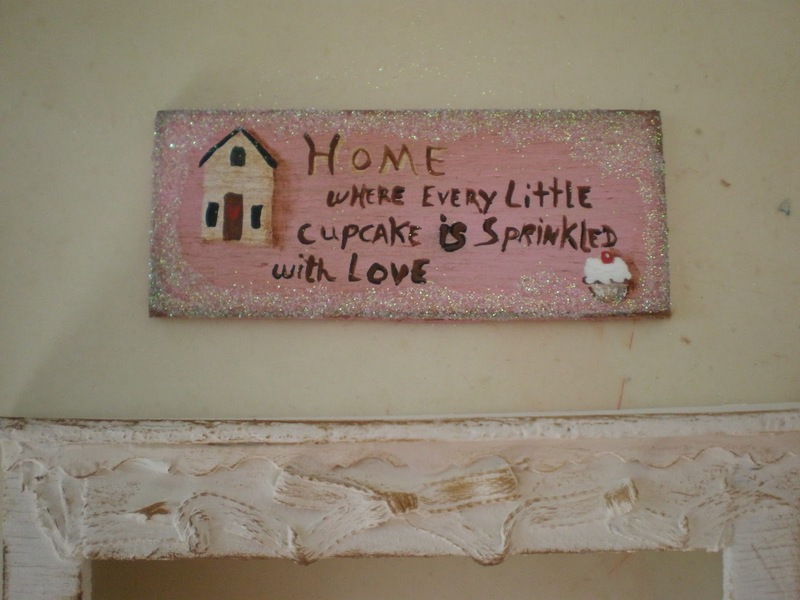 On the sign I added pink, fine glitter and shadows for the house and cupcake. 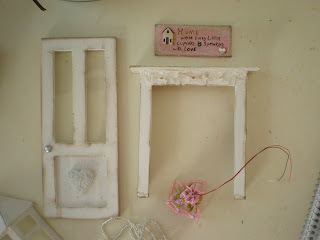 That's the top of the white mantel you see under the sign. I tried something new for this mantel, I used a real ribbon tied into a bow and painted. It turned out fantastic! It hardened perfectly and now looks like a wood carving. 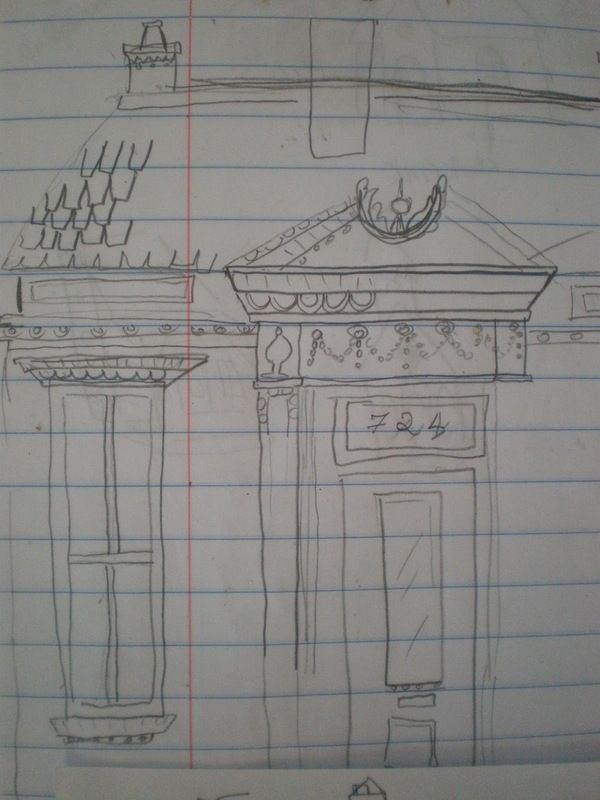 I aged the mantel with a brown ink pad. 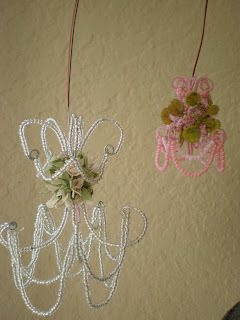 I made the chandeliers too. I'll try to put this little pink one on the front porch. 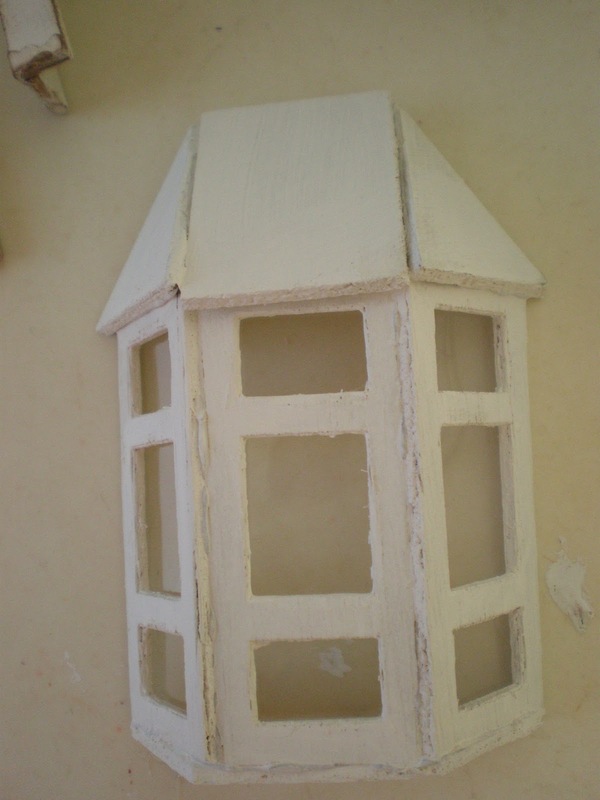 The front will have this little bay window. 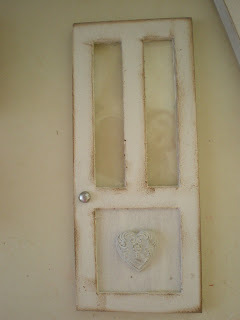 This is the front door. 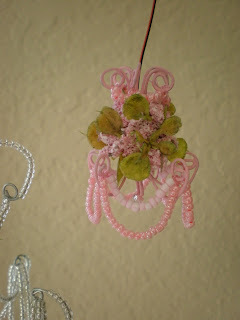 I used a Melissa Frances heart embellishment. 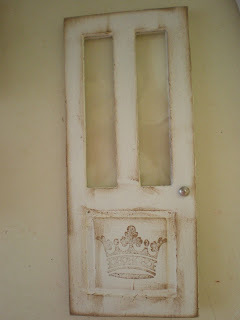 On the other side I stamped a crown in brown ink. 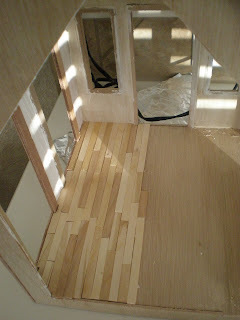 The wood floor is going in. These are Popsicle sticks. The interior is completely coated with plaster. 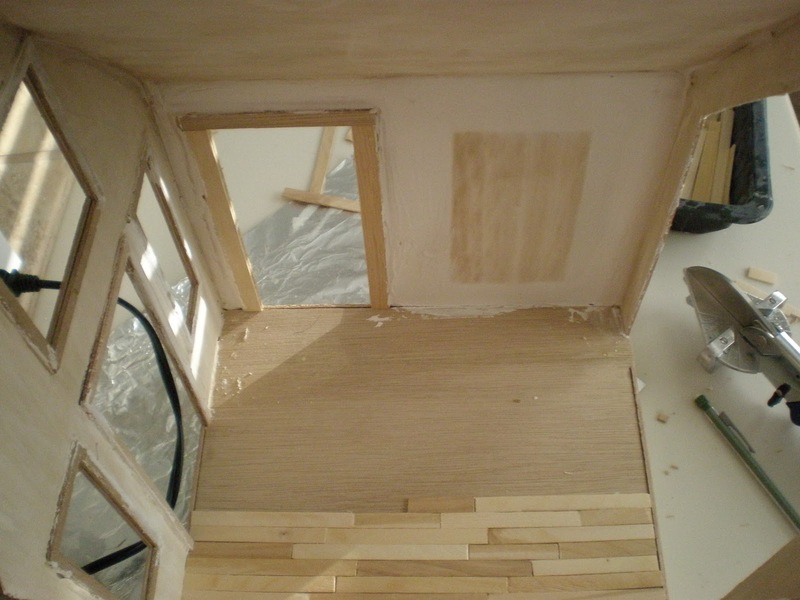 I also started another dollhouse. 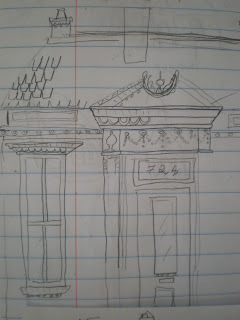 I doodled this house a while back. I have no idea how close to it I can get, but I'm going to try. This will be the Ballerina Cottage dollhouse. I have just put the walls and floor together after having cut out my windows and door. For this one, I imagine a ballerina's tiny place. 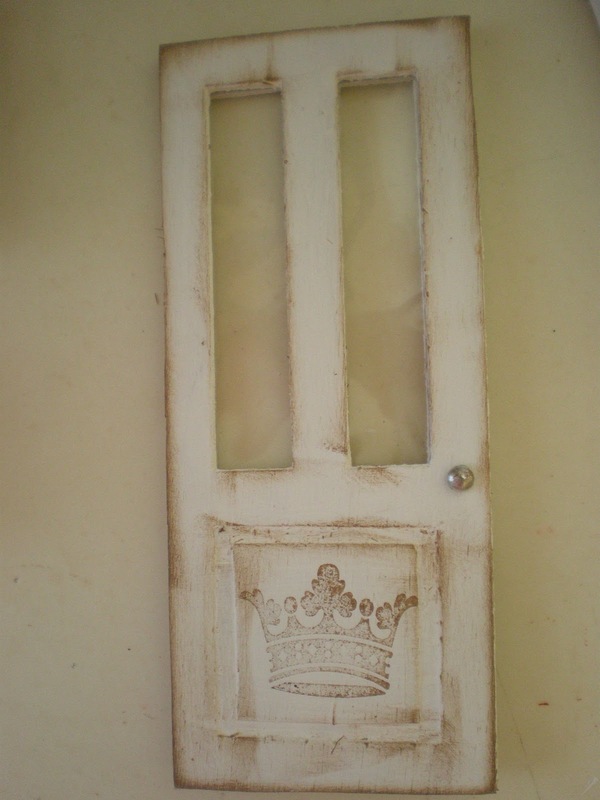 Very sophisticated in cream, ocre and grays. Maybe a wall of mirrors and ballet bar., ballet paintings and photos. Can you envision it? I'm so excited about this one too! 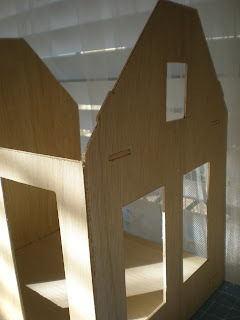 Oh yes, I can totally envision the Ballerina House! That's going to be amazing I'm sure!!! How in the world do you keep thinking these things up? It's amazing! Did you read a lot of fairytales as a little girl? It's always so exciting to see what you come up with in that magical mind of yours!!! Wow! You're overflowing with creativity, Caroline! It's a lot to take in. My head is spinning just looking at all the details. I'm looking forward to the next phase. A ballerina cottage?! How precious and perfect! i can't wait to see how you're going to set up the ballet bars. Both are looking lovely a ballerina house is a lovely idea cant wait to see. Votre projet avance vite!! les lustres sont trop beaux!!! The chandeliers are beautiful. I love the pink one. the cottage is going to be wonderful. Another fantastic idea your ballerina house. The chandeliers are very nice. Good idea the ballerina cottage. Everything is amazing! 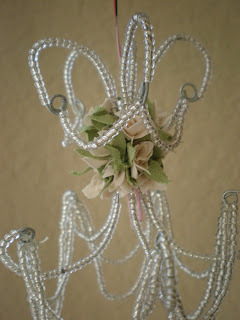 I loved the chandeliers. So glad to hear your Christmas shopping went well........how neat is that, and I would think it would be crazy!! So glad yall had such a good time so much so, that it might become a tradition. 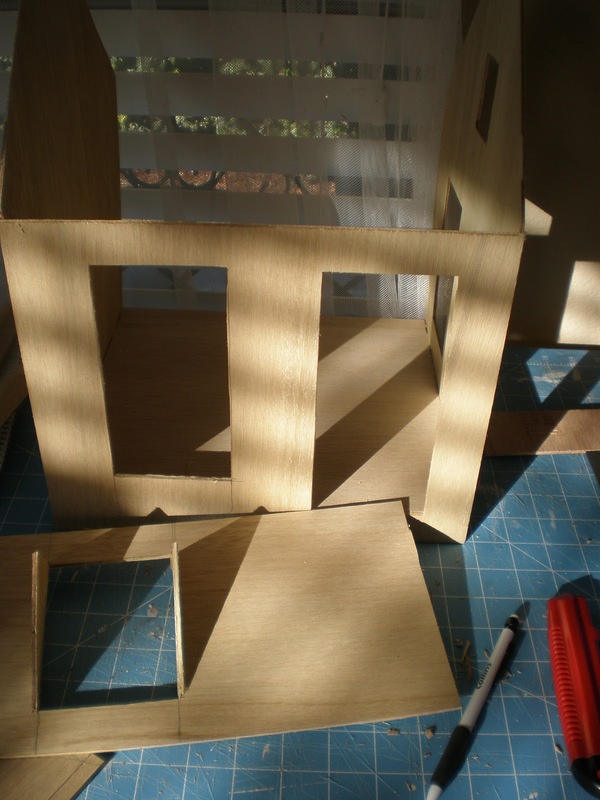 Love your newest idea here, can't wait to see how it all turns out once you put it together, everything is adorable already!